Over the past couple of years, appearances as these from Windows XP, Office 2003, Visual Studio .NET and now Office 2007/2010/2013/2016 have set standards for how an application should look. The techniques for defining the appearance of controls have also become more complex. Before Windows XP, controls were generally flat with single colors for normal state, hover state, checked or down state... With Windows XP, Office 2003, simple gradients for the different control states have become the norm. Now with Office 2007/2010, appearance control has become yet more complex. Controls can now have multiple radial/linear gradients and have subtle transitioning of appearance from state to state. To be able to have full control & flexibility over the appearance of controls, the number of properties has been steadily increasing over the years. At TMS software we have always tried and keep trying to provide components with the latest look & feel as well as keeping backwards compatibility. We want to enable you to create applications with a brand new appearance and simultaneously do not want to break the look & feel of applications that were created perhaps years ago when installing new updates of the components. As the requirements for appearance control have evolved over the years, so have the properties to control look and feel of the TMS components. It has not always been easy to apply new appearance types to existing controls that were originally not designed for more complex appearances. This has caused that various components have sometimes different ways to control the latest and greatest appearance, let alone to synchronously change appearance of multiple controls to a new consistent style. A TAdvFormStyler is supposed to be dropped on a form. In a way, it will control just like TXPManifest the style of the TMS controls on the form. A TAdvFormStyler will only affect controls on the form itself. 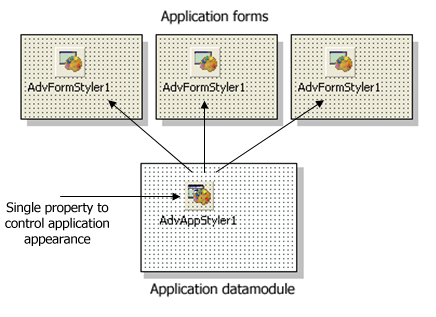 For application-wide appearance control, in addition to a TAdvFormStyler on a form, a TAdvAppStyler component can be dropped on a datamodule and is connected to the TAdvFormStyler components on the forms. By setting then a single property in TAdvAppStyler on the datamodule, the complete application appearance can change, both at design time but also dynamically at runtime. The component TAdvFormStyler has a property style. Setting this style property causes all components on the form that support the interface to set the style to change to the selected style. Similary, setting the style property for the TAdvAppStyler on a central datamodule invokes all TAdvFormStyler style changes and thus the style of all TMS controls on the form. How to have 2 different types of styles in one form? By default, TAdvFormStyler will assign the style configured to all components on the form automatically. You can however override this behaviour and implement AdvFormStyler.OnApplyStyle. This event is triggered for every component for which it will set the style. With setting the Allow parameter to false, the style will not be applied. We hope these new style control components will simplify & accelerate the programmers job to create a consistent user interface and make it easier than ever to switch your complete application appearance by setting a single property.